I’ve known about Blake Andrews for many years. He is a force to be reckoned with in the world of photography, particularly because of his minimally titled blog, B. Steeped in the history of and a dialog about photography, the blog is informative, but its real bite comes when Andrews applies his creative, incisive wit—sometimes so dry that how one interprets him says more about the person reading than what he writes—that makes it a must-read. Those who make the mistake of taking him at face value are said to start bleeding a good 24 hours later from the place his scalpel almost imperceptibly pierced their skin. But we’re here to talk about his exhibit of photographs, specifically his exhibit, Pictures of a gone world at Blue Sky Gallery. 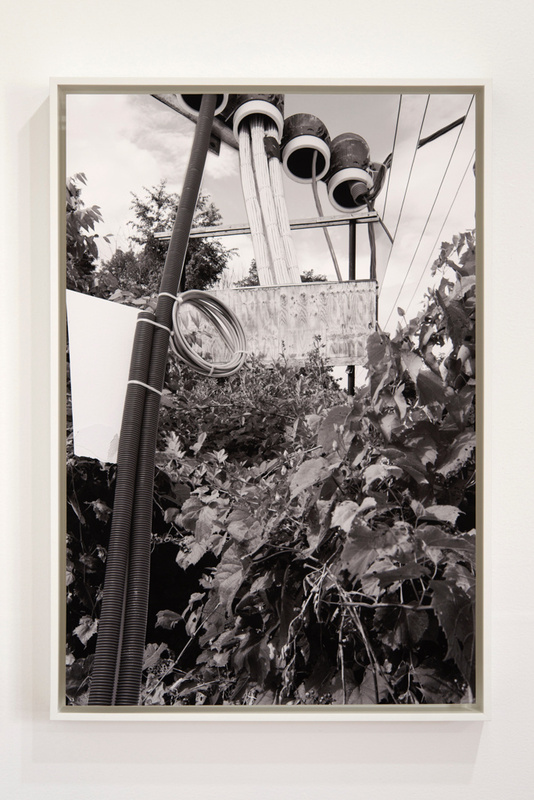 All framed by sprocket holes (not visible in the reproductions here), the 28, black and white, analog photographs carefully attend to a specific aesthetic and technical history of his craft. The subject matter is mostly his wife and kids, which some might consider a bit of a throwback. But the images illustrate the title for the exhibit, “Pictures of a gone world,” which, the exhibit’s PR informs us, is also the title of Lawrence Ferlinghetti’s first book of poems. “Gone?” If I were of a literal bent, I’d see no pending doom in these photographs. (Well, maybe in one photo, but we’ll get to that in a bit.) Quite the contrary: I see joy, even in the most chaotic of moments portrayed in these images, and a lot of fun being had. Oh! “Gone!” Like in “Gone, Daddy, gone,” as in “far out,” taking things to a new level, or being unconstrained. It is a vernacular older than Andrews; another time lost; still, albeit anachronistic, applicable for this exhibit.